Working out what to do with an old tree stump can be a challenge! Digging them out by hand can be extremely laborious and time-consuming, while excavator hire can be pricey and may not even get the job done properly. In many situations, the best course of action if you want to get rid of a tree stump is to use our stump grinding services. So rather than attempting to dig the stump out by hand or use an excavator, we use specialist stump grinding machinery. So this gradually chip away at your stump. Therefore making its complete removal fast and cost-effective. Use your old stump for something useful! 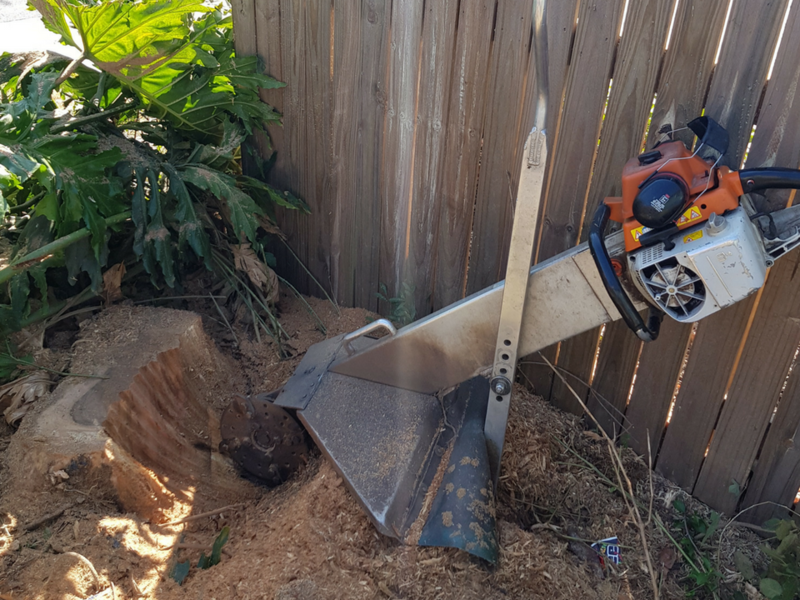 Our stump grinding service involves using a stump grinder to take small “bite-size” chunks out of the trunk. The chunks are useful organic material which can be used for mulching, to fill holes or uneven areas or as enrichment for soil. Not only is this solution environmentally friendly, but it also means that you don’t have to pay extra to get the waste stump material removed. We have three differently sized stump grinding machines available. Certainly, includes small, medium and large. What this means for our customers is that we are able to reach stumps in almost any location. If you’ve got a stubborn stump on a steep gradient, or one that can only be accessed by carrying a machinery through your property. We have equipment that’s portable enough to take where it’s needed. Even if you’ve got a stump on or near a retaining wall, we still have a piece of machinery. These certainly can reduce it to a pile of wood chips without damaging the wall. Getting rid of your old tree stump isn’t just a way of freeing up space for fresh plants or grass. Also, it levels out the area, reducing the risk of a trip hazard. 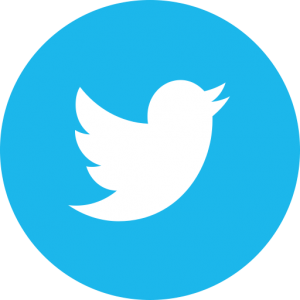 Therefore, enabling the land to be used for building on if required. Furthermore, if left undisturbed, a tree trunk can become an ideal environment for all sorts of unwanted pests. This from termites through to mould, fungi or other plant diseases. Removing the tree stump provides one less place for these unwelcome species to thrive. As expert arborists, we are able to advise on any tree management or stump removal issue. Even if you’ve had an unwanted stump in place for years; haven’t been able to work out a way to get rid of it; hence we can still usually come up with an optimal solution. 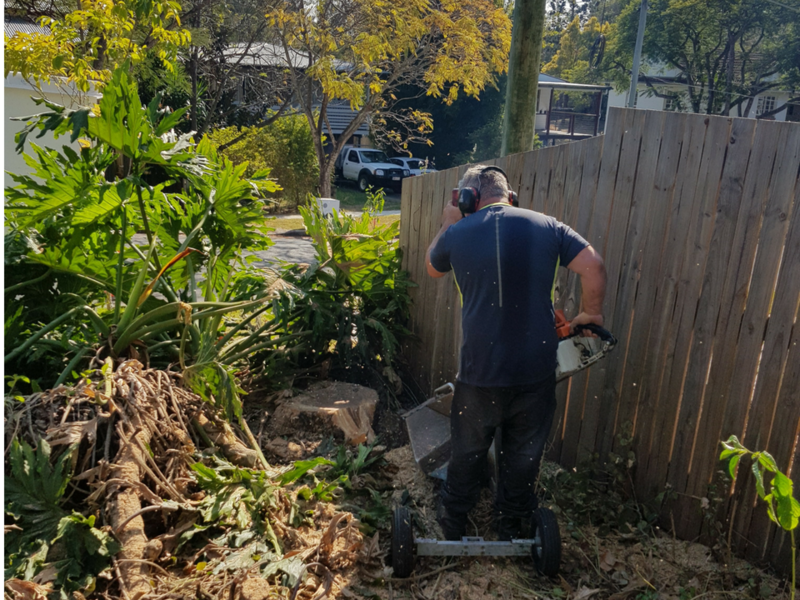 Our competent and expert team has the right equipment and skills to grind away the most stubborn of stumps, leaving you with a pile of useful mulch and some additional space to use as you wish. We are competitive and offer a fair, honest service to homes and businesses in Logan, Ipswich, Brisbane, and the surrounding area. Why live with an unwanted stump? So call us today for a FREE stump grinding quote.